Weather on Steroids explores the consequences, challenges, and opportunities that arise from the changing climate on our planet. The exhibition partners artistic and scientific communities to create a visual dialogue about the vexing problem of climate change, and explores how weather variability affects the day-to-day life of local communities. The exhibition investigates Southern California vulnerability to climate change, and draws on the region’s scientific expertise at the Scripps Institution of Oceanography, whose investigators are at the forefront of climate research. Weather on Steroids brings together artists and scientists to reflect on humanity’s role in our changing climate and to envision new possibilities for a sustainable future. The focus is on weather extremes fueled by the steroids of climate change and their impacts on society: heat waves, atmospheric rivers, and drought with impacts on health and agriculture; deluges, sea level rise, and coastal erosion; extreme winds and devastating wildfires. Science serves as a basis and inspiration for imaginative and creative responses from artists. Artists’ subjective images and scientists’ objective scientific results reveal how climate change upsets the planet’s balance with extreme weather impacts. By illuminating the reality of climate change, Weather on Steroids aspires to take a proactive local role to engender collaboration between art and science for the benefit of cross-disciplinary and public education. Was produced for the Exhibition from mixed media, recycled and repurposed materials, by Oscar Romo in consultation with CW3E’s Alexander Gershunov. It is one example of CW3E’s research inspiring art and contributing to Weather on Steroids. 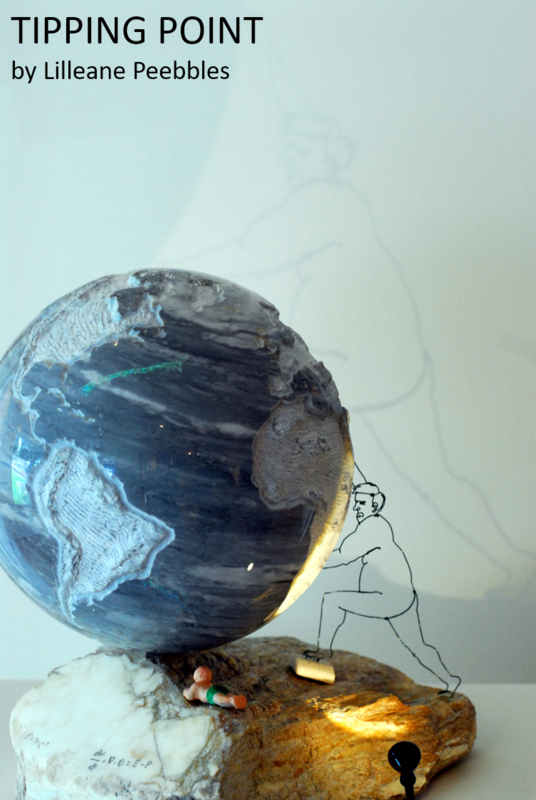 Each installation at the Exhibition is accompanied by 2 didactic panels: one from the artist and one from the scientist. Excerpts of the panels follow. 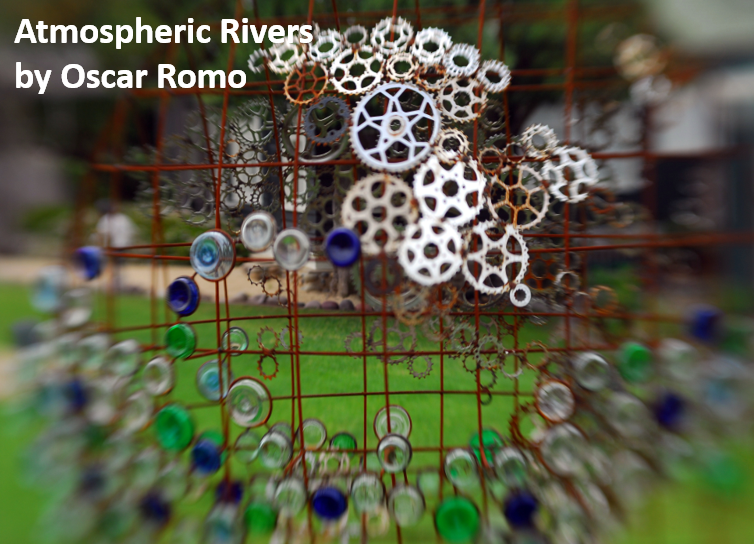 On Romo’s Globe, continents are made from bicycle sprockets. Tropical moisture and atmospheric rivers (ARs) are represented by the bottoms of bottles collected from the Tijuana River. The Globe is directly exposed to landfalling ARs and is designed to rotate and rust as it catches wind and moisture. Global warming, includes trends in climate extremes (e.g. drought) and extreme weather events (e.g. heat waves, floods, hurricanes, atmospheric rivers) that are devastating and locally felt. These changing extremes can register climate change acutely in our individual experiences. Yet the connection of regional weather extremes to global climate change is somewhat like the connection of an athlete’s performance in an individual sports event to her use of steroids. The steroids are only a partial and obscure cause of any individual outcome, yet their impact is evident in the statistics of the athlete’s performances over an entire season, especially when compared to pre-steroid seasons’ statistics.